“Teamwork makes the dream work.” This John C. Maxwell quote rings true to every single successful organization. Yet, when working with others in any capacity you may find you are at a disconnect, based on differences in communication or behavioral styles. Because of this, projects could take longer than needed and feelings of frustration may arise between coworkers. Understanding communication and behavioral styles can improve sales, teamwork, hiring and fit within co-workers. The DISC Assessment can help you do just that. 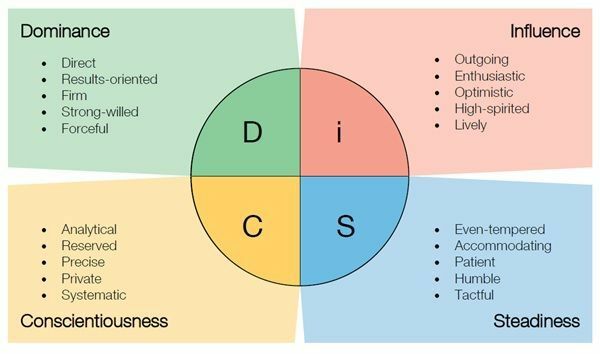 DISC measures behavior on four dimensions: an individual’s Dominance, Influence, Steadiness, and Cautiousness. DISC is not a personality test. It will show how your salespeople sell, how your managers manage, and how one’s observable behavioral style affects our actions and how well we work with others. How is the DISC Assessment useful in improving my business? When individuals in a group have complementary behavioral and communication styles, they can improve coordination, help employees feel more involved, and maybe even spur innovation. When they clash, they can drain an organization of its vitality and leave a legacy of posturing, power struggles and misunderstandings. The DISC assessment helps you to understand how certain behavioral styles will work with other behavioral styles, and who will perform best at each stage of the project. To make the best possible use of the strengths of each team member, identify their behavioral style and pair them with others who will constructively build upon one another rather than tear each other down. The cost of turnover can easily be three to five times an individual’s salary. DISC can help you hire smarter, by understanding where the applicant would fit in best within your organization, and to understand how they would react to a specific set of circumstances. Does a candidate’s DISC profile match how he or she is presenting themselves? Does their personality fit the type of person you envisioned for the position? Will they fit into your company culture? What anticipated challenges do you have for this candidate based on his or her behavioral style? Will this individual’s behavioral strengths benefit your organization? These are all beneficial questions you can answer by knowing your potential hire’s DISC profile, as well as your team’s. Getting to know your own personality is a great way to understand how you can build a supporting cast to help you be better at the things you need to focus on to drive growth in your business. By knowing your own DISC profile, you will also understand how to maximize your relationships and interactions with your business, friends, family, spouse and children. You will benefit from a personal understanding of why you do the things you do, why you like what you like and why you’re good at what you’re good at. DISC also provides a framework in which communication and interpersonal relationships can be personalized and individualized to specific members of your staff. Knowing how your behavioral style works together, you can tailor your leadership style to them based on their priorities and strengths. Regardless of what industry your business is in, all managers are in the business of “people.” Your job is to orchestrate people to get the work done. The DISC assessment will help you utilize your employees to the best of their abilities by understanding how your employees work, communicate and think. 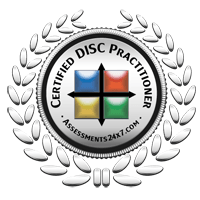 I am a Certified DISC Practitioner, which means I am licensed to teach, explain and assist teams in the implementation of the DISC communication tools. Other assessments I have available are Sales IQ, Emotional Intelligence, different behavioral effectiveness assessments, and judgement profiles. THIS MONTH ONLY, I am offering a BOGO special. If you buy 1 DISC assessment for yourself or your team, you will get a 2nd DISC assessment free ($69 value each). This offer is available for up to 3 free DISC assessments. Complete this form and we will get you started.